I had a few problems with Season 6 of The Simpsons, feeling that in many ways, the early hints of the rot that would later infamously make the series less and less entertaining, but I have to say that other than a few episodes and that continuing feeling that it’s hard to really accept that the Simpsons are your average American family when the number of reasons they ought to be world-famous keeps mounting (Homer on tour with Hullabalooza without mentioning his successes with the B-Sharps, Bart vying for the Radioactive Boy role but nobody remembering that time he got famous on the Krusty the Clown Show), but some extremely strong episodes are in this season. In many ways, this marks the season where the core of Simpsons characters who carried the early shows and actually developed much faster than I had expected before rewatching the whole show in order begin to seem played-out and get gradually less interesting. 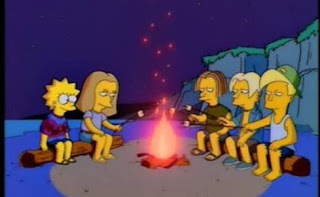 Bart in particular begins to be more an accessory to other stories than carrying things on his own, and the last episode of the series nicely establishes that (a) most teenagers see him as trying too hard rather than being cool and (b) sometimes his selfishness makes him look like such a jerk that it’s important that he makes amends with kinder gestures. Similarly, Homer is getting progressively more simple-minded, though he’s still a way off being a psychotic idiot. Getting morbidly obese for a more comfortable life is about as far as his crazy schemes should be able to go. Perhaps the character to come off worst from season 7 is Mr. Burns. After the cliffhanger at the end of the previous series turned him into, as the show itself states, a cartoonish cackling villain rather than a mean but feeble old man, he begins his descent into caricature. The episode where Homer fills in for Mr. Smithers may be the last hoorah of an interesting and nuanced Mr. Burns, the one who surprised me with his complexity in the first three seasons, but when he is literally trying to kill Bart by kicking him into a safe hard enough to knock both overboard while stealing artworks, it’s easy to feel The Simpsons has moved a long way from its origins or any chance of the show portraying identifiable problems for average people. On the other hand, this is also where the rich cast of minor characters truly begin to shine, with episodes specifically focusing on that. There is also another very strong Apu episode which is very timely even now, decades later, with illegal immigration still a hot topic. With Bart and Homer becoming less central, Lisa and Marge are also given the chance to shine and become interesting characters, Lisa’s making friends on the beach trip, newfound vegetarianism and decision to keep her town’s history a secret for the sake of others all very strong moments of development for her. It’s also nice to see the show keep attempts at continuity going here, with Lisa committing to her vegetarianism, Selma keeping Jubjub and at least Mr. Smithers remembering how central the Simpsons seem to be to his and Mr. Burns’ lives. Marge, too, gets some strong episodes and depth. Part of the joke of her character is that she’s simple and boring in many ways, but she has her neuroses and passions too. It may seem hard to imagine her going to the work picnic and getting blind drunk on the punch by this stage, but the episode where she becomes a social climber gives her some real flaws, which go hand-in-hand with increased depth. While the cracks are indeed showing and The Simpsons’ glory days will end soon enough, season 7 was stronger than season 6 and there are still a number of truly brilliant episodes to come before the sharp decline. And hey, even now, The Simpsons can produce good episodes. The one with Marge and Lisa competing to go to space was strong.